Collingwood is a vibrant and growing city on the shores of Georgian Bay. It is actually one of the fastest growing cities in Ontario due to it's proximity to Toronto and it's placement as a beautiful four seasons outdoor activity destination. With it being the city feeding Blue Mountain and the water activities and lakefront cottages of the other side of town you can ski in the winter, golf, bike and boat in the summer and many have year round cottages in this beautiful spot in the world. Collingwood has many of it's weddings hosted at private cottages along the water, however if you don't have access to something like that or you need a space that is more suited to hosting large events you can choose from Craigleith Ski Club, Blue Mountain Resort, The Westin Trillium House, Horseshoe Valley, Lora Bay, Cranberry Golf resort, Bear Estates, WaterStone Estate and Farm, Belcroft Manor, The Manor by Peter & Pauls, and the Blue Mountain Conference Centre or the Peak of Blue Mountain. The number of different venues is excellent and I especially love Lora Bay Golf Resort as the top wedding venue in Collingwood. It is actually located just outside in Thornbury, but it's proximity to the water, it's beautiful clubhouse and ceremony site gives a unique feel to your wedding and the service is impeccable. They care greatly for their brides and grooms and will do everything needed to make your day fantastic. There are a few really nice photo locations in the Collingwood and Blue Mountain area. 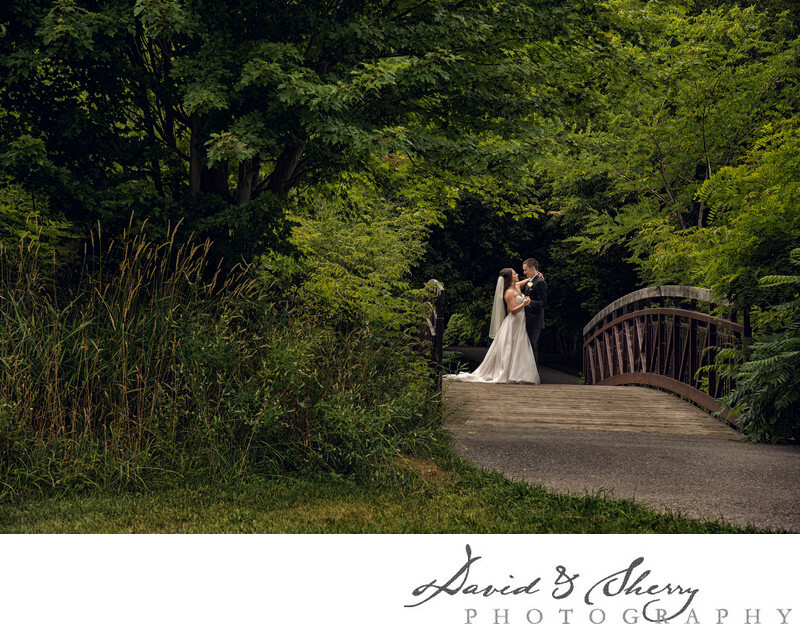 The Arboretum is a large and spacious park with a central walkway through the park, boardwalk along the marshy areas, open spaces great for large bridal parties, and access to the waterfront for some beautiful beach photos. We have taken everything from family photos, bride and groom pictures, images of the bridesmaids, groomsmen, ushers, flower girls, ring bearers, maid of honour and best man here and the space works for it all. Lighthouse point is another favourite spot as it gives a great view of the grain silos which highlight the skyline of the city. It also provides a wrap around beach excellent for pictures of a couple walking down the sand. Blue Mountain peak is another excellent spot as the lookout at the top of the mountain gives unparalleled views. Though limited in the number of looks you can get, the few you can are very worth while. Blue Mountain Village is a resort town at the base of the ski hill. It has very specific architectural requirements for the buildings built in the area and as such offers a unique look for the background of your images. It also has a lake in the middle which you can get out on the dock or a paddle boat to take some interesting wedding pictures. If you are looking for one of the best wedding photographers in Collingwood, give David & Sherry a call as we have endless creative and natural photos of brides and grooms on the days of their weddings and we would love to photograph you at one of our favourite locations or wherever your wedding may be.